Northern Virginia finally has its own interactive children’s museum, thanks to the new Children’s Science Center Lab in Fairfax. This museum, which opened in June, 2015, specializes in hands-on demonstrations of science, technology, engineering, and mathematics (STEM). Its exhibits are designed for children aged 2-12, but parents and older siblings are likely to enjoy them, too. The Children’s Science Center Lab is located in Fair Oaks Mall, at the mall entrance between Lord & Taylor and Sears, facing Route 50. The museum sits in a 5,400-square-foot facility within the mall. 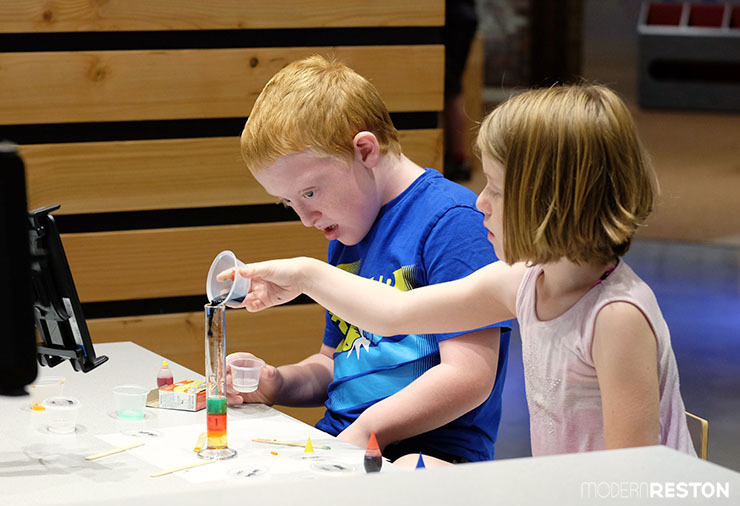 This museum is known as the “Lab,” and it is the first (and smaller) of two museums run by the Children’s Science Center. Plans are currently underway to open the second museum in the year 2020 at the Kincora development in the Dulles area of Loudoun County. That branch of the Children’s Science Center is expected to be 53,000 square feet in size, and is likely to rival any world-class children’s museum. If the Lab at Fair Oaks offers just a small example of what is planned for the larger museum, then we can expect quite a treasure in 2020. I visited the Lab in late June, on a weekday afternoon. The museum is typically busy on weekday mornings and all day on weekends. I arrived during a more quiet time than usual. Consider your child’s educational needs when you choose your own visiting time. The staff at the museum told me that most kids enjoy the exhibits more when there are lots of other children there to interact with and learn from. On the other hand, children who struggle in settings with lots of commotion and sensory stimulation might prefer to visit after 4pm on a weekday, when it is quieter. 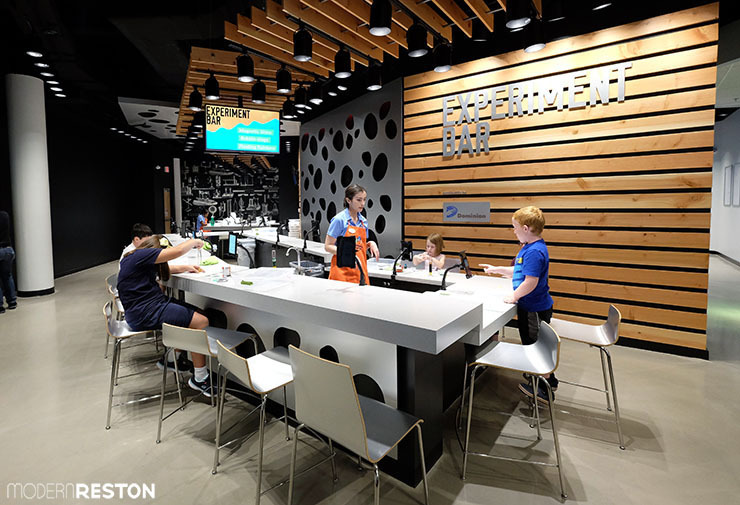 When you enter the Children’s Science Center Lab, the first room you encounter is the Experiment Bar. This exhibit offers children a choice of four experiments that demonstrate principles of chemistry, biology, or physics. Digital tablets are mounted around the Experiment Bar, offering step-by-step instructions to guide visitors in their selected experiments. Each mini-scientist is given a set of pre-measured supplies and tools for each experiment. A popular experiment on the day that I visited was a test tube rainbow made of various colorful liquids with different densities. I also watched children make a stretchy concoction called “magnetic slime.” The museum offers a choice of four experiments, and a new one is introduced into the rotation every few weeks. 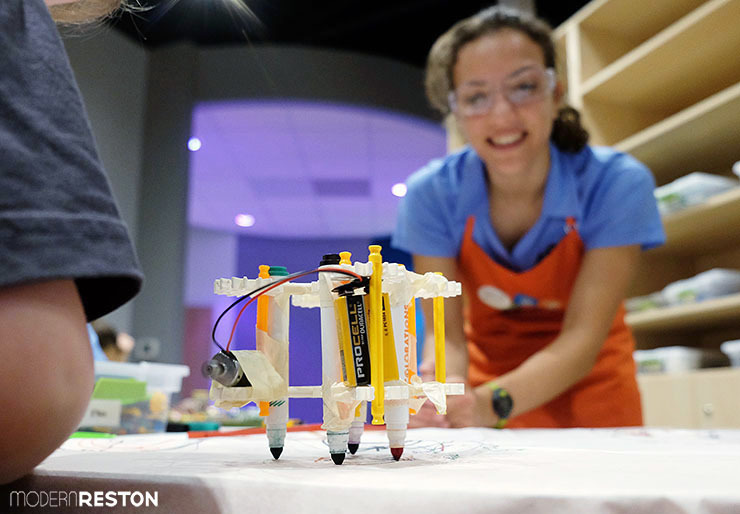 Another room is the Inspiration Hub, where kids can explore real-world applications of STEM. 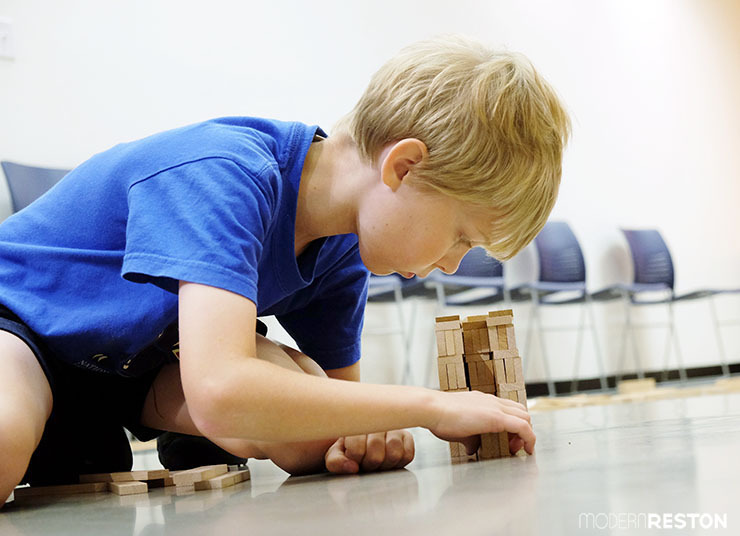 In “Chain Reaction,” kids can use use magnetic ramps and wheels to build a labyrinth for balls to roll down a wall. 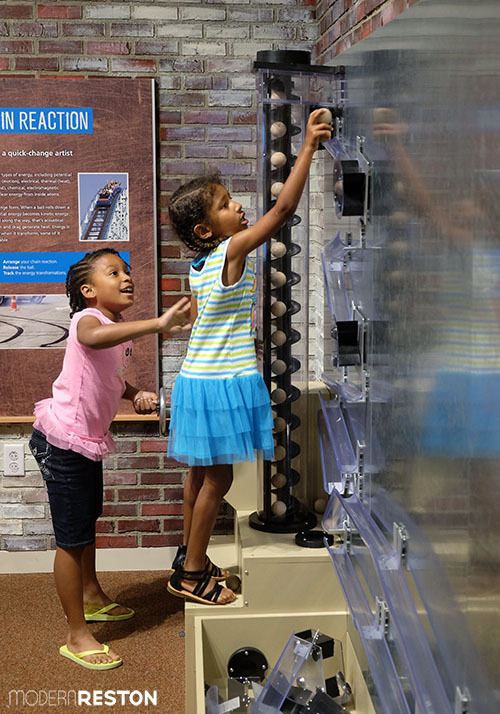 This exhibit lets kids explore principles of engineering, and demonstrates kinetic energy, friction, and drag. 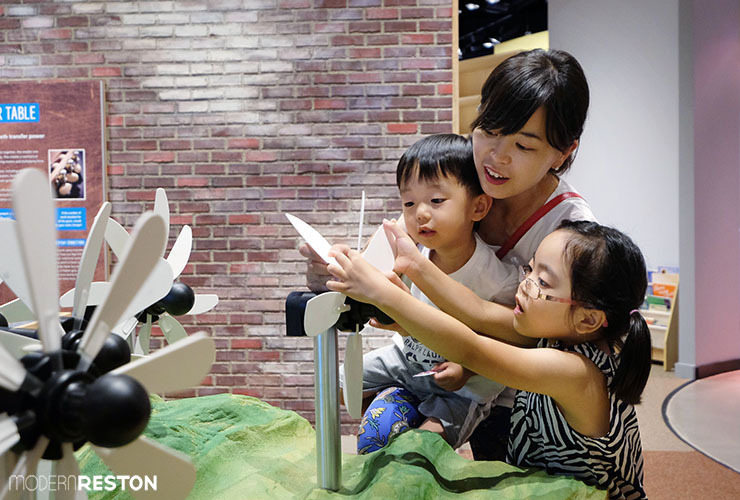 Also in the Inspiration Hub is an exhibit called “Catching the Wind,” where kids can design wind turbines and test them in a wind farm. Other exhibits in this room include a table where kids can arrange gears and cranks, and a demonstration of various types of power within a city. Attached to the Inspiration Hub is a multi-purpose room that can be used for classes and parties. When I visited, it was filled with Keva Planks for open construction play. A ten-year-old boy was using his developing engineering skills to create a wall that was sturdy enough to resist impact. Another room at the Lab is the Tinker Shop, a workshop filled with gadgets, circuit boards, construction materials, and craft supplies. 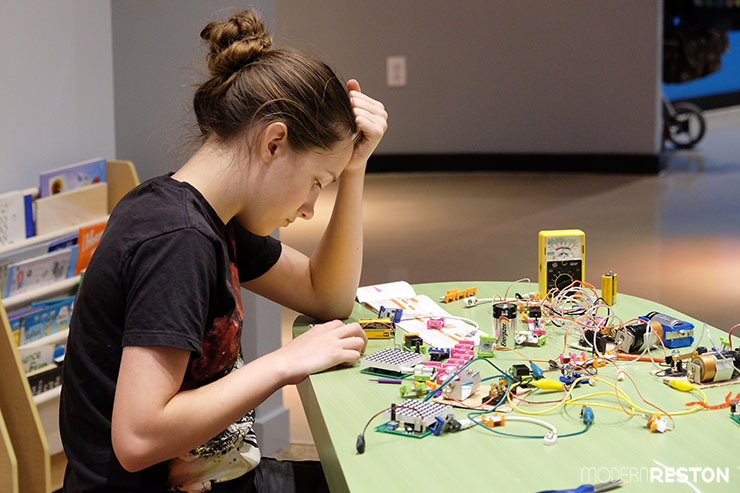 The museum staff can assist with a variety of activities, including robotics, circuits, and a wind tube. Seen above is an “artbot,” a creation that draws by itself. Young engineers of any age would enjoy the Tinker Shop. While I was there, I saw kids as young as 3 and as old as 13 actively engaged in the projects in this exhibit. The tasks are easily adaptable to skill levels and interests, and I suspect many parents could find themselves absorbed in them, too. One of the highlights of the Tinker Shop, and the museum in general, is the enthusiasm of the staff. The staff members I spoke with were intelligent and friendly, and their academic backgrounds were diverse and complementary — college majors included engineering and early education. They had a shared excitement about the projects they offered as well as the ones they were preparing for later dates. I found myself wishing I could stay longer and help them with the microwave they were disassembling for a future project. I have never before had an interest in taking apart a microwave, but their enthusiasm was contagious. 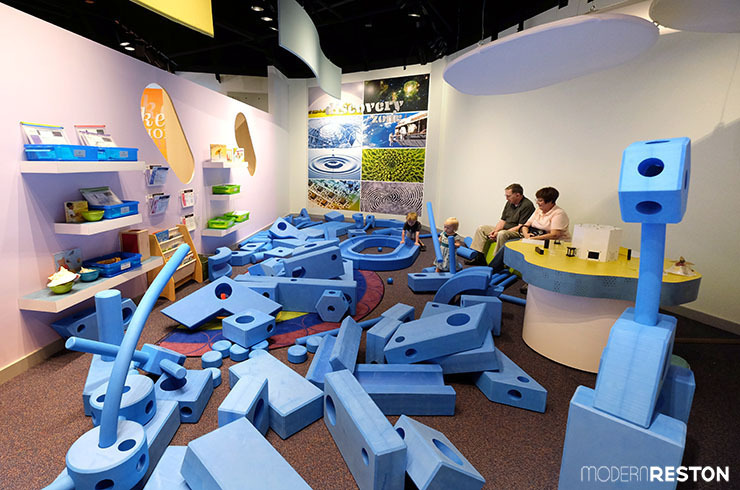 The final room in the Lab is the Discovery Zone, which is designed for children aged five and under. The room is filled with enormous building materials that kids and adults can use together to create towers, tunnels, and bridges. 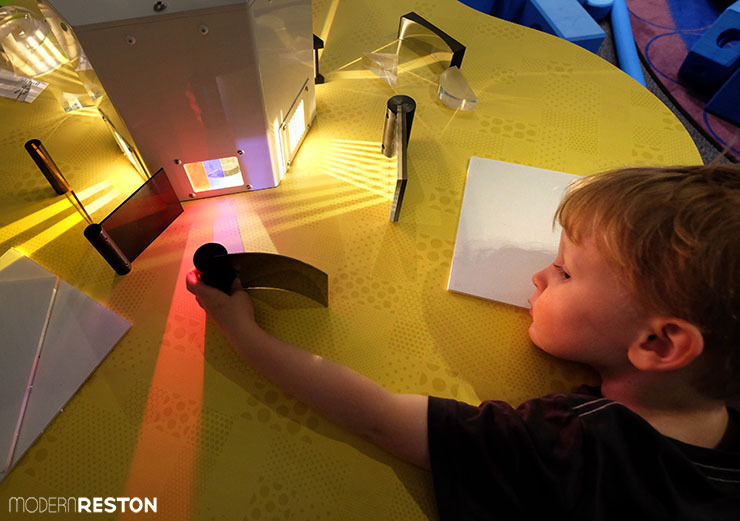 Several discovery boxes are available for hands-on exploration, and a light table gives kids a chance to experiment with mirrors and shadows. The Children’s Science Center Lab is located in Fair Oaks Mall (11948L Fair Oaks Mall, Fairfax, Virginia). It is open 10am-8pm on Fridays and Saturdays during the summer, and 10am-6pm all other days. Admission for visitors ages 2 years and older is $12.00. Admission for seniors (62+) and members of the military is $11.00. Children under 2 years are free. Group visits, field trips, and parties are available.